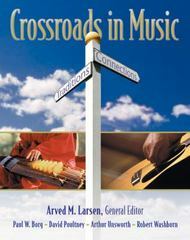 Crossroads in Music 1 Edition Organized chiefly around music themes and music in culture rather than the basic style periods of Western art music, CROSSOADS IN MUSIC provides a basic introduction to music that integrates and explores the similarities among Classical music, popular music, and world music. A user-friendly text designed for non-majors, the book is comprised of 37 brief, topical chapters that keep students interested in and focused on specific ideas. The package (text and audio CD set) is one of the most inexpensive on the market.